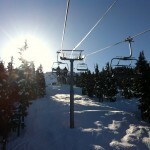 Uploading to Blackcomb – sunny skies! This weekend, Nick and I managed to nail a weather window that called for moderate temperatures and sunny skies after a few days of good weather following a big storm. This meant that a good skin track was likely set around the Spearhead Traverse and the conditions would be fast for travel in the alpine and a luge-like descent down Singing Pass. The Spearhead Traverse is 34.20km long with 1,667 meters of elevation gain. 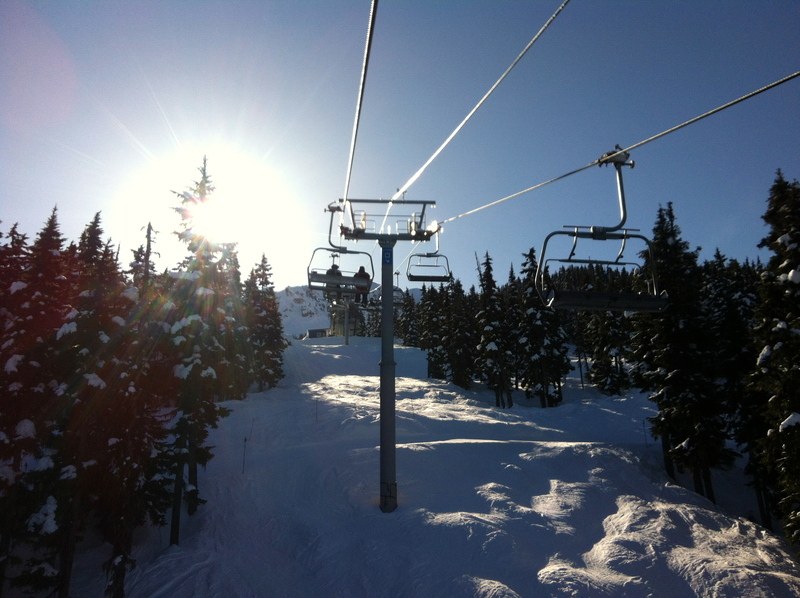 The timed traverse begins at the Blackcomb backcountry gate and ends at the bottom of the Blackcomb Gondola in Whistler Village making for a net elevation loss. 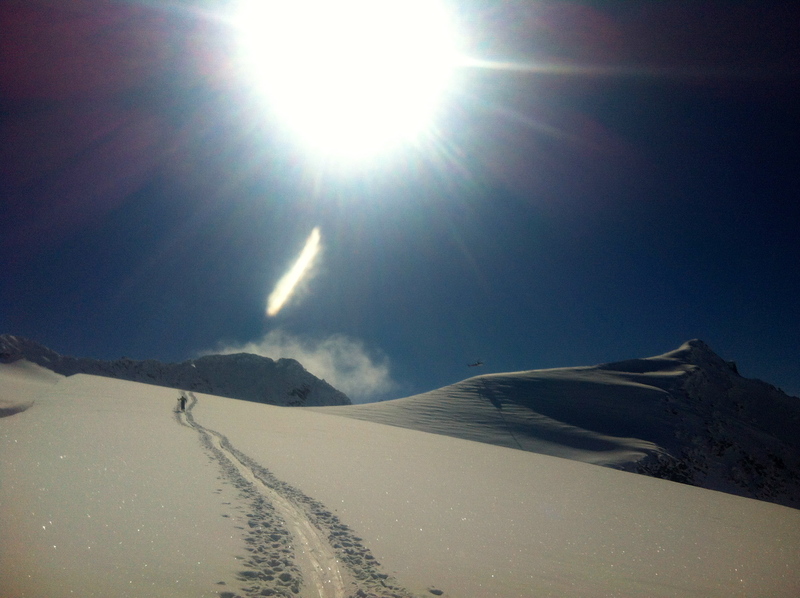 Skiing out Singing Pass – this is the “Short Spearhead” and is one of several possible variations but is the fastest. The previous fastest known time (FKT) is Greg Hill at 4hrs 1min. We uploaded the Blackcomb gondola at a reasonable hour and stopped at Glacier Creek Lodge for me to dry my jacket after discovering a leaky water bottle. 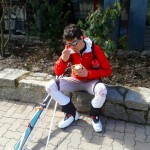 We headed for the Blackcomb Glacier Backcountry gate and took a few minutes to repack our bags and apply skins. 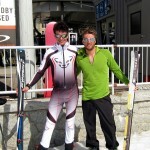 We also bumped into the guide who instructed my AST-1 course – Guillaume Otis. Lots of tracks leading up to East Col. The first few climbs (East Col, Decker, Pattison) went quickly with one fall on the descent from East Col. On Decker and Pattison we used the left hand variation to save some time. A large group of Norwegian skiers at East Col seemed very surprised when we arrived and transitioned. The climb to the Tremor-Shudder Col is one of three big ones and is followed with a short skins-off descent and another short climb to the Ripsaw. Since leaving Blackcomb we saw many many heli ski groups being disgorged on peaks along the traverse. It was very distracting. Given the enormous and remote tenure that these heli companies have I am surprised to see so many skiing in an area so easily accessible by touring. 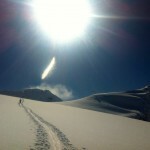 Get the heli skiing out of Garibaldi Park and the Spearhead Range! Nick skinning towards the Ripsaw – heli landing nearby. The next few glaciers wizzed by in one long traversing descent until we arrived at the base of the Iago Glacier, the second big climb. 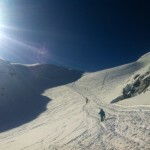 The descent to the Diavolo Glacier was crusty and we launched off two large (3ft) avalanche crown lines near the top. The Diavolo Glacier is the third major ascent and the hardest because of its protection from the wind and the hard angle of the sun. Roasting, we slowed a bit on this climb to the Fitzsimmons-Overloard Col. A short climb to overlord and then up to the Fissile-Whirlwind Col, we bumped into local guide Alex Wigley and cruised toward Cowboy Ridge. We hoped to avoid an ascent here but didn’t see a good track going around so put on skins one last time to get to Singing Pass. The Pass descent went fast and smooth with luckily no uphill traffic. It was filled in with major moguls and a few big dips but never had to take skis off. Crossing the Peak-to-Peak Gondola cut, the snow became warm and sun affected and slowed down considerably. We had lots of double poling to do but knew we were well ahead of our time schedule. Cruising down to Whistler Village we stopped for a photo at the Gondola, ice cream at Cows and then hopped in the car back to Vancouver. I’m pretty excited to finally finish something that I have been obsessing about for over a year now. 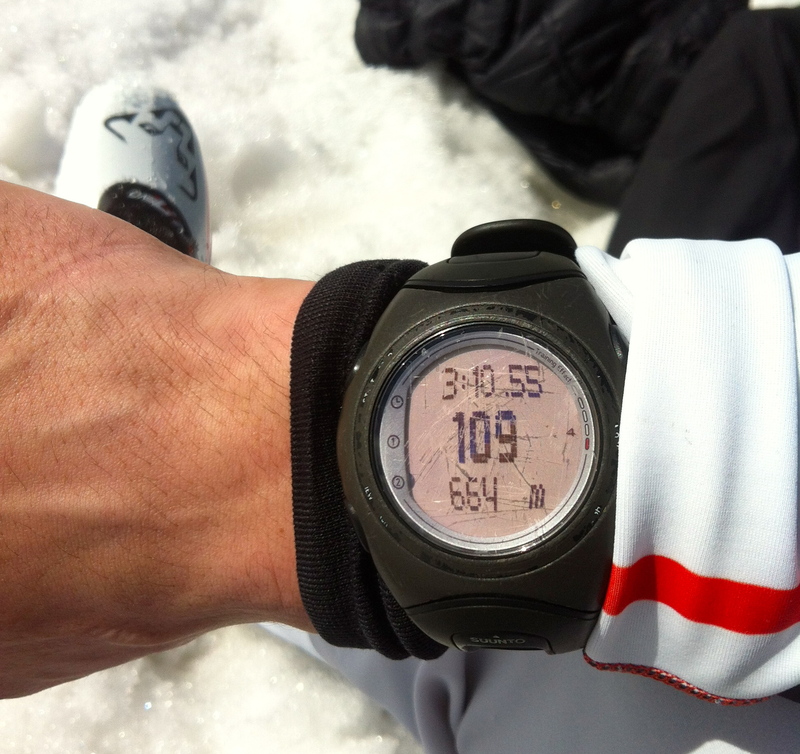 As far as I know this is the new FKT for the Spearhead Traverse. There is still plenty of room to push it sub-3 hours and hopefully some others step up to try! GPS Track is available for those interested. We got a bit of press from the Whistler Question who posted an article on our time. Eric finishing off the day with ice cream from Cows. Nick E Photo. Camp Rapid 260 Race pack with: 1 pr light gloves, 1 pr heavy gloves, hat, shell pants, Patagonia Houdini Jacket, Patagonia Nanopuff Jacket, Shovel, Probe, Beacon, space blanket, multitool, 3 ft cord, map, Suunto t6 HRM. ***UPDATE*** For those considering attempting an FKT on the Spearhead Traverse: I recommend the use of the Full Spearhead Route rather than the above described ‘Spearhead-Lite’. Brad Schalles is currently the FKT holder for the Full Spearhead, starting in Whistler Village, skinning up Blackcomb, traversing the Spearhead and then returning into Whistler Ski Area to the top of Whistler Peak, before descending the runs back to the Village, in ~6.5 hours. 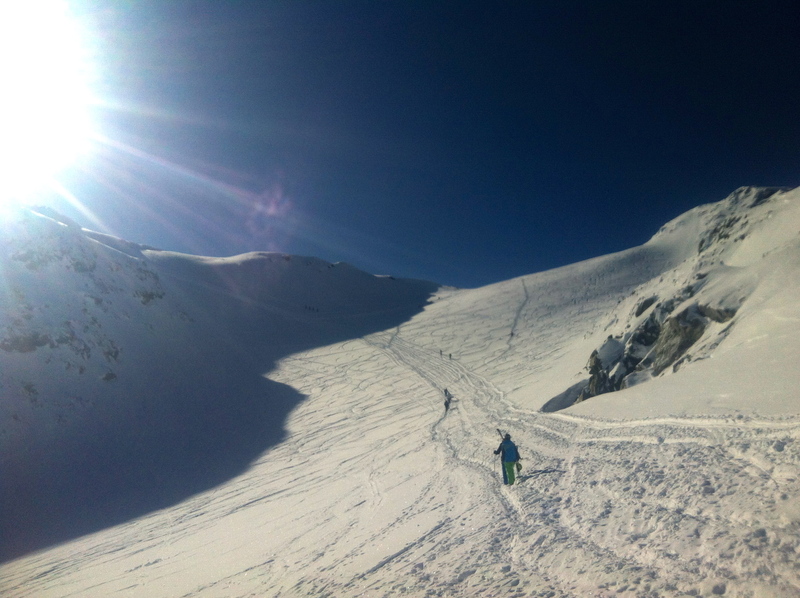 Having now skied both variations myself, I believe this to be the better option for several reasons: 1) No need to wait for lifts to open on Blackcomb – you just need to be sure no any control is being done before skiing up into that terrain. 2) Singing Pass can be notoriously bad down low, especially after the melt-freeze needed for the rest of the traverse. 3) It is a much more aesthetic loop, starting and finishing in the same spot and entirely human powered. I’ll be attempting a fast trip around the Full Spearhead in seasons to come and I recommend that others do as well! This entry was posted in Race and tagged Alpina, Dynafit, FKT, Gu Energy, Leki, Nick, Patagonia, Plum, Race, Spearhead, Spearhead Traverse, Whistler Blackcomb. Bookmark the permalink. Well done boys!! It’s about time that someone smashed it. Progression is so essential to our sport. I did it with zero food, 188 volkl g4’s and always knew it could be done a lot quicker. Thanks for pushing it. Greg – Thanks! We met very briefly at the Powderfest in Nelson a few weeks ago. Hard to imagine going that fast on heavy gear. 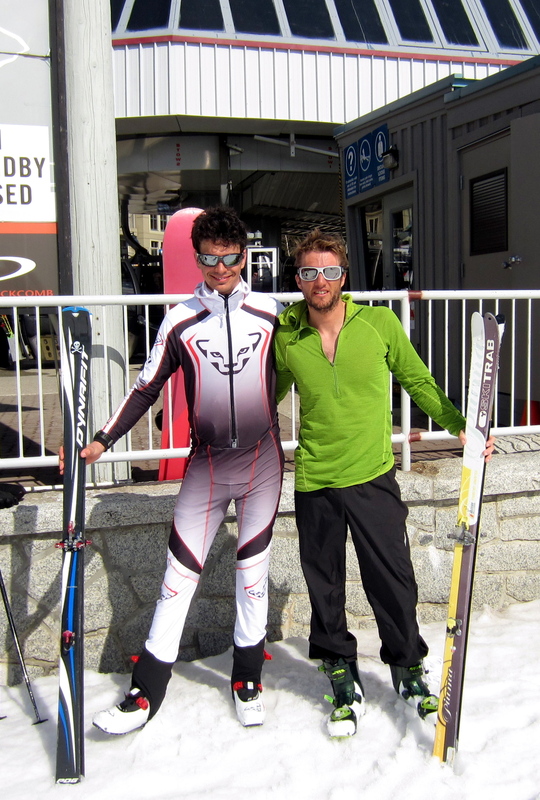 We had a considerable advantage on stupid light skis and boots. 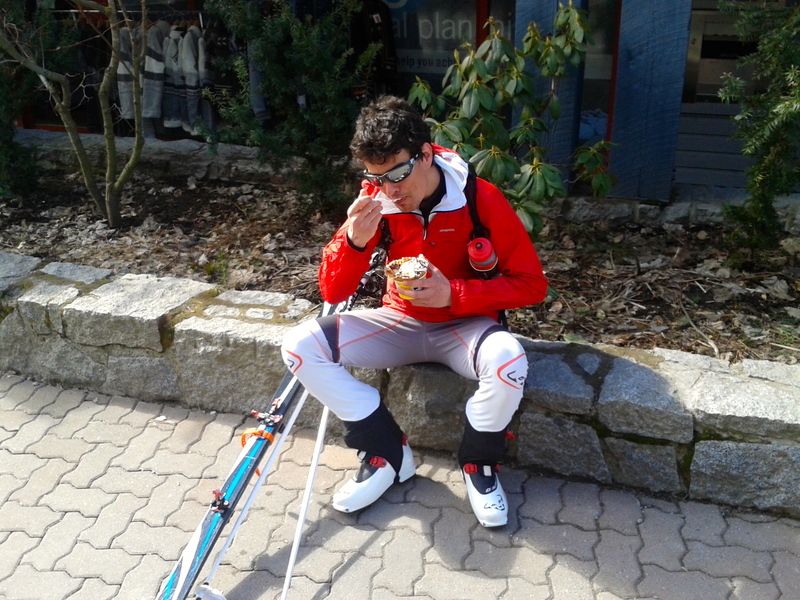 And just coming back from a Skimo Race on Sat too, crazy guys! Nice work!! Nice work gents! Where’s Nick’s spandex?? way to go guys!! Good to some fresh blood coming into the sport! You guys are fast! Nick, I’ve got a suit for ya! Shattered! The new gauntlet has been thrown down! I always thought Greg Hill’s 4:00 hr time was Whistler Village-to-Whistler Village (or better yet, Longhorn-to-Longhorn). I didn’t realize it was from the Blackcomb backcountry gate-to-Village. Good push. Cool suit. Nice work there gentleman. Damn. 3:10 is rediculously fast. I did it on Tuesday with Tyler in about 8, but I carried too much gear and hit the wall going up Iago. Plus some whiteout conditions. I was aiming for 6 or 7. Sick time guys! I only thought some Euros could pull off a time like that. Stoked to see Nick get the record on my old dynafit race bindings! Interested in taking the speed traverse one step further on the McBride range traverse. I would like to pull out the one piece unitard for crack at it.